This week schools are on half-term, and as my private pupils have all gone on exotic holidays, I have a whole week free for research and writing. The interludes will be going to La bohème at ENO on Wednesday, and going to a workshop at the Oxford Life Writing Centre at Wolfson College, Oxford on Saturday. On Tuesday I’m giving a talk about my research for the MA students at Brookes, which I’m currently planning and will finish on Monday. For what feels like some time I have been searching the Austrian National Library’s newspaper archive ANNO for information about the careers of the first performers of Die Fledermaus at the Theater an der Wien. There are several challenges involved, not least that these newspapers are all printed in Gothic script: in some of the digitisations, the script is perfectly clear and legible. However, in others, the print is slightly smudged which can make it difficult to make out the letters. In addition to making a spreadsheet of newspaper references for the performers, I am also making a note of the articles and reviews which seem most interesting, and printing those articles. They’re far easier to transcribe and translate on paper. So far I’ve been searching for the principal male performers, including Jani Szika, Ferdinand Lebrecht, and Matthias Rott. Often the search function does not recognise the search terms — because of the difficult font — so although I found hundreds of entries when I searched for JANI SZIKA and jani szika and Jani Szika, it still didn’t find them all. However, when I searched for FERDINAND LEBRECHT, the search produced many entries which also mentioned Szika. In addition to the spreadsheets that I’ve already mentioned, I have been keeping a record of cast lists to see how the Theater an der Wien used its regular performers in its very busy repertory system. Thanks to Patrick Dunleavy’s terrifying book Authoring a PhD (Palgrave Macmillan) I spent several hours last week devising detailed chapter plans. This was a far more taxing (and useful) process than I’d expected. The more chapters I worked on, the more clearly I could think about what I’d already done and what I needed to do. Dunleavy uses a straightforward system of sections for each chapter, and avoids the very broken-up, bitty approach. Writing so many c. 10,000 word chapters can seem like trying to find one’s way through a dense forest without a map or a compass, and I am very glad I found this book. It has had a salutary and calming influence. Today I re-read part of Angus McClaren’s The Trials of Masculinity: Policing Sexual Boundaries, 1870-1930. McLaren deals mainly with court cases in Britain, the United States, and France, but in his conclusion there were several ideas which I think will be helpful to explore in my first chapter in the context of mid-nineteenth-century Austria, so my notes from today’s reading have now been incorporated into a new plan for that chapter. I’m particularly interested in ideas about marital infidelity and masculinity for this section: the potential for infidelity hangs over Die Fledermaus, although nothing truly adulterous takes place. 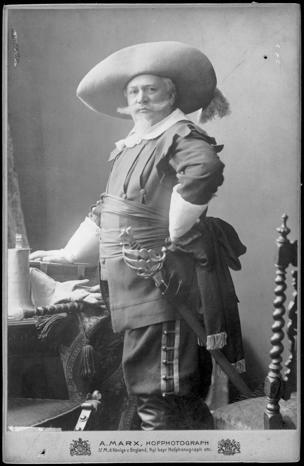 Strauss’s librettist recast the suggestions somewhat when he adapted Le Réveillon, in which the Eisenstein character, Gaillardin, admits to a far more scandalous past involving the patronage of a courtesan. Die Fledermaus offers us a sanitised version, in which we can draw our own conclusions about the fidelity of Eisenstein and Rosalinde. Would she have erred and strayed with Alfred if he hadn’t been dragged off to prison? McLaren quotes Alison Sinclair (The Deceived Husband: a Kleinian Approach to the Literature of Infidelity, (Oxford: Clarendon Press, 1993)) on the topic of masculinity and infidelity, so Sinclair is another reference for me to investigate this week. To conclude, here is a picture of Jani Szika, not in his role as Eisenstein.